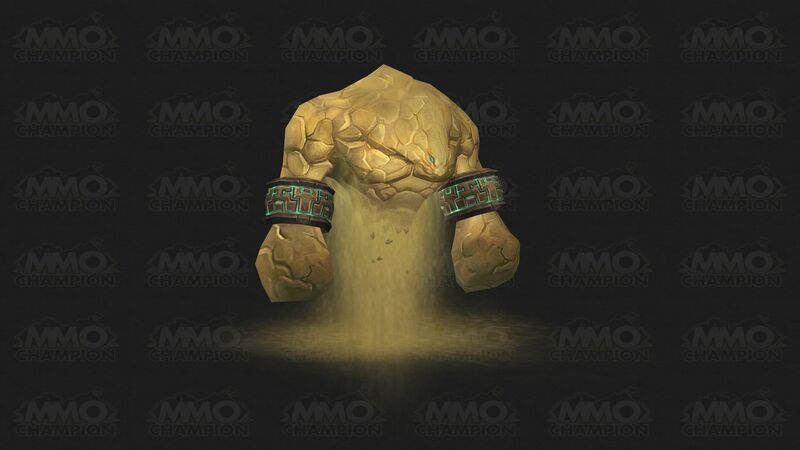 There have been datamined screenshots released of something that looks very vaguely like a classic water elemental (a la Ondulin d’eau) only made of sand. It looks almost just like this icon. The lack of a petbox as a source (like this pet at current) usually indicates that it will be an achievement reward of some sort, but they may just have not added in the specific item that you learn it from yet. Supposedly this pet drops in Trône du tonnerre, we don't have any more specific info, i would guess its just a raid-wide zone drop? Possibly a reference to the Chinese Mi Gao? Or, Increase Sand. Pretty much just an animate clump of sand. This is how it might look like. Could this be a legendary pet? It's name is in yellow and if you check the wow armory Blizz has legendary pets in the list of companions. Way better than the Unliving Sandling. Living Sandling is in the pet journal for PTR 5.2. As posted earlier this is the correct model for this pet. It's source is currently labeled as a drop in the Throne of Thunder zone. It does not list a specific boss or trash mob. It is an elemental pet which learns the following abilities at the listed levels. Clic droit pour invoquer ou renvoyer votre sablon vivant.